Trying to switch to sending out hand written reports electronically in pdf format by scanning them. Still using the Viewer, but have been looking at Bookmarks, Destinations and Bates Numbering in the Editor also. In Acrobat 7 I had added a sequence that created a list of Bookmarks in the document with their details. Is anything like that planned for the Editor? I think it may just be a script that someone came up with. That would be great to have for what I am planning to do. A list of Bookmarks or a list of Destinations would be great. If I go this route I will switch over to the Editor once I can customize the UI, and the Links tool works on par with the Viewer. However, if you added Page Numbering and possibly Destinations to the Viewer I would happily stick with it though! The Viewer can already use Destinations to create Bookmarks it seems. Is there a plan to add a Button tool to the Editor? The one I used in Acrobat allowed you to right click and duplicate the button on other pages. Great tool for returning to the Index Page. There are no button tool for now - form creation functionality will be available soon. I'd like to second Arnolds request about link creation. This is the single most missing feature that for years has been (and still is) forcing me to use Acr*bat for serious production work -- which in my case means creating internal document hyperlinks like on a per minute basis, while browsing and working with the document. This issue is also shown in the above screencast video. Thanks for considering the improvement of the link creation tool. 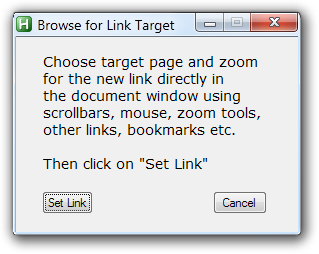 In my view, it is indispensable to completely get rid of the cumbersome link target dialog of PDF-XChange Editor-- and instead simply use the Editor window itself to browse for the link target! Last edited by David.P on Thu Oct 09, 2014 12:59 pm, edited 1 time in total. As I said before, we are looking to have forms creation added in the next few builds or so. As for the link tool, a revamp might be necessary and we will certainly look into it. Having spoken directly with Ivan (lead developer), I suspect such a tool is already on the wish list. Though no promises can be made at this time. Thank you Patrick, for your fast reply. 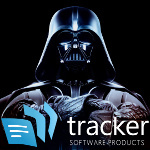 Patrick-Tracker Supp wrote: As for the link tool, a revamp might be necessary and we will certainly look into it. ...gets removed (or is made optional, in the sense of a "Link Properties" dialog). otherwise (having to use the link destination dialog) it is close to unusable for regular use. ...without arduously having to draw an imprecise box around the text manually. It would be great if this could be improved, because as I said, this is the single most missing professional feature in PDF-XChange Editor, in my view. Last edited by David.P on Thu Oct 09, 2014 12:15 pm, edited 3 times in total. Thanks for the follow up. That will most definitely be added to feature request as well. Glad to hear that Patrick, thank you. I have created an internal development ticket to help track this request. Please reference this forum or RT-2742 when requesting an update. Thank you for all your great suggestions. In the Viewer I can create the links I need by highlighting text and using the right click context menu. This is not possible in the Editor. I am fine with this as I still use the Viewer. I can then use the Editor to do the page numbers. I decided to use the underline option in Appearance to reinforce that the text was a clickable link. However, this does not work properly in the Viewer, and creates a box instead of underline in the Editor. If an underline with a width of 1.0 is created in the Viewer, it is not visible in the Editor or Acrobat or other viewers. If other widths such as 1.5 are manually set, they can be seen, but look different in each program the file is opened in. It is invisible in the Viewer also if opened in another viewer first. Windows XP sp3 with latest versions of Viewer and Editor. I know there are updates for the Editor due out in a couple of weeks. I also know that you do not plan any new features for the Viewer. I sincerely hope you will address this problem in the Viewer though. I think this is a bug in an already established feature of the Viewer. That way there is the option of using the Viewer for links while the Editor is being developed. I went back to an old computer and did some links with Acrobat 7. I believe that David P. is correct that the Link destination dialog is unnecessary. Links can more easily be done in the document itself. He obviously does a great deal of work with Links, and he should know. I think that the auto snap word selection feature he mentioned would be a good option for links, highlighting, etc. The way selection works now is imprecise. Regards being able to select some text in the Viewer and use a right click context menu to create a link based on the highlighted text, we will be adding that to the Editor, probably in 311. There is a formal Feature Request for this: RT#2746: Feature Request : add right click link options to text selected with the 'select tool'. I'm not 100% clear on the issue with the underline in the Viewer. Are you using underline on text in a comment, maybe the typewriter tool? Can you provide a sample file that illustrates this? The underline is in the Links Properties -> Appearance Options -> Border Style. The last option in the drop down list allows you to underline the Link. I think it is an effective way to highlight a Link. If the Border Width is set to the 1.0 setting in the drop down list below, it does not work properly. Border width can be set manually to say 1.5 for the underline, but it does not have a consistent look in other programs including the Editor. At least it is not invisible with the 1.5 setting. Thanks for the description, I've reproduced this here and have created a ticket for this. The ticket number is RT-2749. Regarding the issue with links appearance in difference Viewers, could you please list what Viewers, specifically, you are seeing this as this appears fine in Adobe Reader. Acrobat 7 professional, the Editor (latest version), and PDF Viewer Plus SE (Nuance), all seem to display the 1.5 Border Width thinner than the Viewer. Acrobat 7 only has 3 settings for this same underline - Thin, Medium or Thick I believe. Later versions may be able to fine tune this feature more. 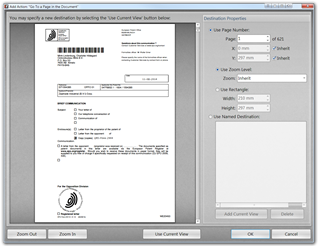 The version I have of PDF Viewer Plus SE is from version 12 of Paperport SE. The very latest version of Foxit Reader (7) looked exactly like the Viewer. The latest portable version of Sumatra (2.5.2) did not show the 1.5 underline at all, but the link did work. I am using an older Dell laptop running Windows XP sp3. Hopefully the plan is to fix the 1.0 underline problem in the Viewer. 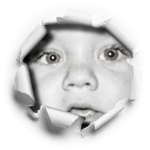 The Viewer is essential software for me, and I really enjoy using it. It helps me to make a living. I expect I will feel the same way about the Editor in the near future. 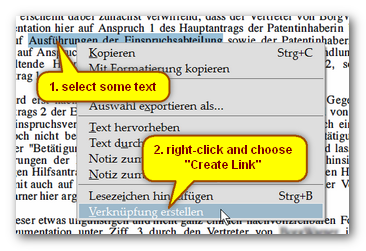 Paul - Tracker Supp wrote: being able to select some text and use a right click context menu to create a link based on the highlighted text, we will be adding that to the Editor, probably in 311. There is a formal Feature Request for this: RT#2746: Feature Request : add right click link options to text selected with the 'select tool'. Happy to hear that Paul! Yes, the request is in. But as always, please do be aware that we cannot guarantee the implementation of the feature, only consideration. Ultimately, it's up to John (CEO) and the Dev. Team. Thank you for adding the Bookmark PlugIn. It works like the extension for Acrobat I mentioned in this thread previously (I believe it was here). I use it when sending out post job reports much as I had planned. Would it be possible to add a Sub Title section to put explanatory notes, etc. in with it's own formatting and font size? It would be nice also if you could add a little space between the Title section (Sub Title section if you add it in) and the links themselves. Just some separation between them would be nice. You just can't make some people happy can you? Borders for all types of annotation in the PDF specification are specified in points (1pt = 1/72in), and, as a result, when you zoom your page, visual border thickness is changed. But, Adobe, as usual, "adapts' the specification to suit their needs and a border width for link annotations they treat as specified in pixels, i.e. it does not depend on zoom level. can we get some more detail on these requests - perhaps with an example or notes to an example on what you are hoping for ? I think I need to forget underlining as a way to highlight links for the reasons you point out. What I see in the Viewer or Editor often looks different in other programs. I believe the best route is to use the PlugIn and put a note in about the links. Attached is what I had in mind concerning the build of the Table of Contents. Below it is what the PlugIn currently produces. Thanks for that - understood and we will pass it along for consideration. We will follow up in the other topic.